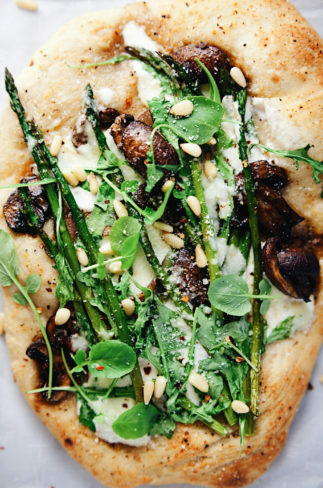 Pizza night has never been easier! 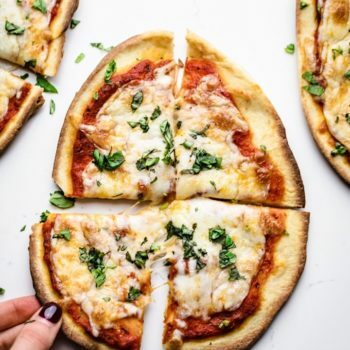 10-minute Naan Pizza that has a golden crispy crust, tons of cheese, and is so yummy and quick. Your family will love this simple recipe that takes no time at all to make! 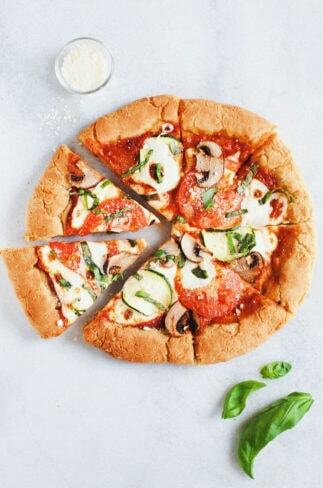 Say hello to the quickest pizza recipe ever! All you need is 4 ingredients, 7 minutes to bake, and you have the crispiest, golden mini pizzas that are SO yummy and EASY. When Drew and I first got married I made naan pizzas ALL the time for us. 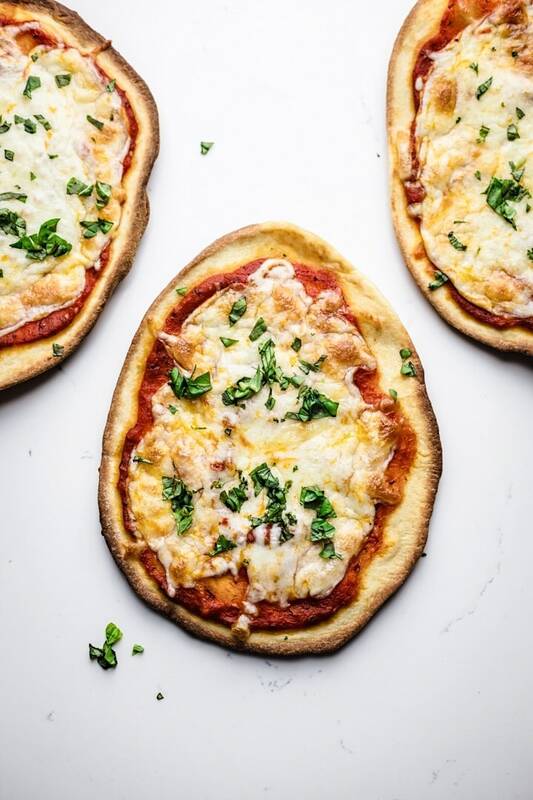 It was so easy for me whip these pizzas up and serve them alongside a salad or our favorite soup! I’ve made these pizzas for countless family dinners and parties. They are ALWAYS a hit and I never have any leftovers! So whether you are making pizza for your family, a party, or any occasion, this recipe is your new best friend. 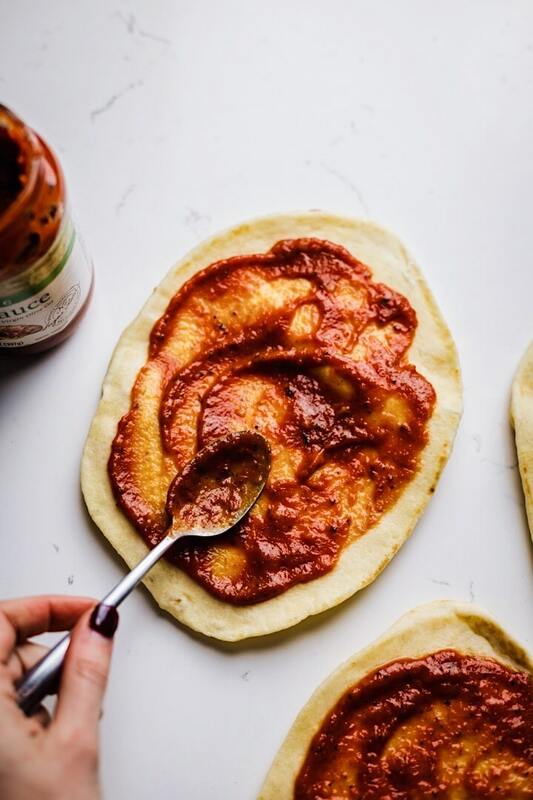 #1 Sauce – use a homemade pizza sauce recipe or your favorite store bought. 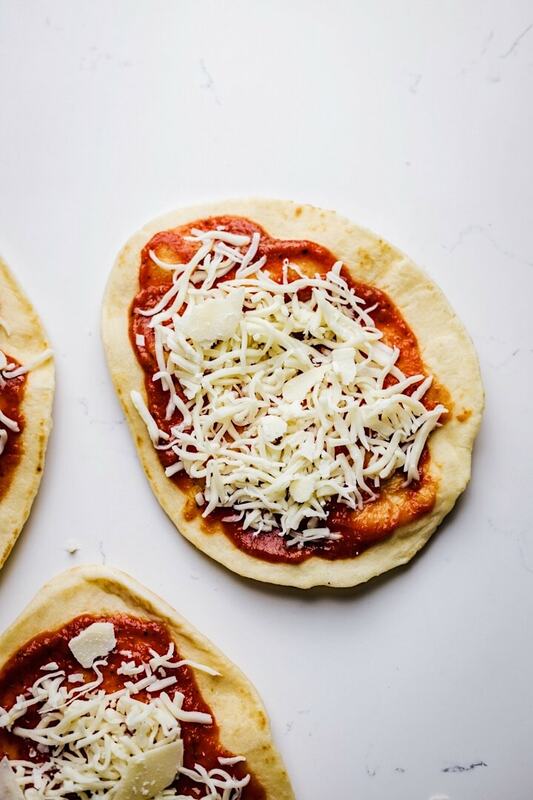 #2 Add your toppings – Sprinkle shredded or sliced mozzarella and a little parmesan cheese. You can also use your favorite Italian cheese blend. Enjoy your naan pizza’s along side a big salad or if the weathers colder – a cozy soup! Like my Healthy Tomato Basil Soup or this Tuscan White Bean Soup. SO yummy and perfect for pizza dipping. 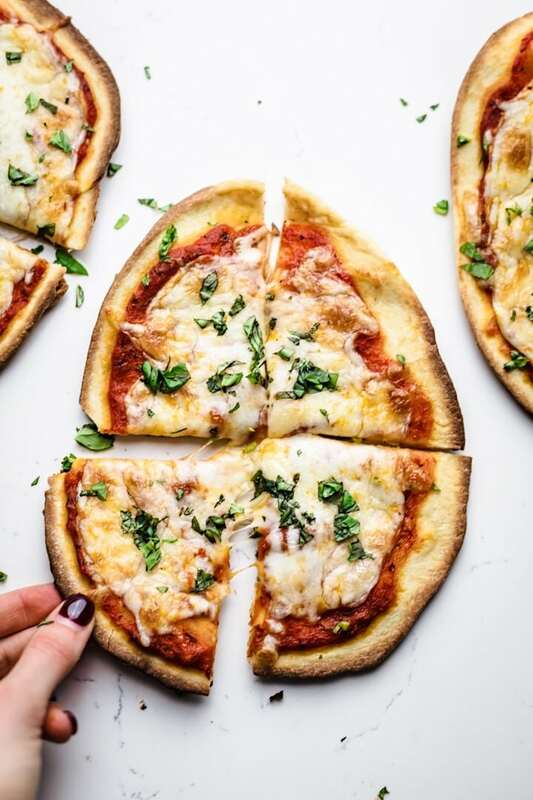 Making naan pizza more crispy: make your naan pizza more crunchy and less doughy by pre-baking the naan bread. Bake for 3-4 minutes in the oven, carefully remove — add sauce, cheese, extra toppings, and bake for 3-4 more minutes or until cheese has melted. This will give your pizza more texture and a less doughy taste! Extra seasonings: I love using tons fresh basil over my pizza. You can also add fresh/dried thyme, oregano, and red pepper flakes for a tiny bit of heat. Swap regular naan bread for whole wheat to make this recipe more wholesome. Spread pizza sauce evenly over naan bread. Then sprinkle shredded mozzarella cheese - you can also add parmesan cheese if you have on hand. Bake on the oven rack for 7 minutes - the crust and cheese should be golden brown. 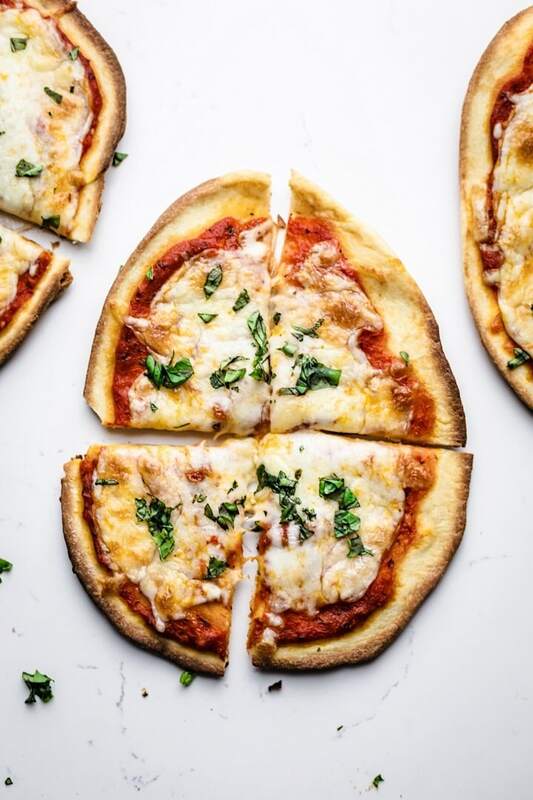 Slice and serve with fresh basil, parmesan cheese, and any other additional toppings. Making naan pizza more crispy: a step occasionally I do to make my naan pizza more crunchy and less doughy is pre-bake the naan bread. Bake the naan for 3-4 minutes in the oven, carefully remove -- add sauce, cheese, extra toppings, and bake for 3-4 more minutes or until cheese has melted. 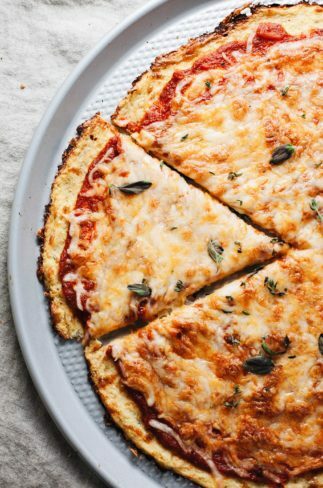 This will give your pizza more texture and a less doughy taste! Make this recipe healthier by using whole wheat naan bread.